What we call a "Time Series" here at MSGHero can also be referred to as a "Drip Delay Sequence". It's when a Messenger Subscriber is sent a series of messages with specific time delays between each one (no triggers are necessary for this type of messaging sequence). It's independent of keyword and button triggers! Time delays are the only trigger in these flows. The Messenger Subscriber does not need to respond at all in order to receive the second, or third message in your time series. It's sent automatically regardless. The best way to think about it is like an email auto-responder sequence. You know when you generate an email lead and you can send them a series of emails separated with time delays? That's what MSGHero can do for you (but within the Facebook inbox instead of the email inbox). In this article, I will cover how to create a time series inside of MSGHero as well as the different ways you can trigger a Messenger Subscriber into a time series that you have created. Please Note: Time series messages are the best way to educate and engage with your subscribers in order to build a good relationship with them and earn their trust. You can share information, educate and update subscribers in follow up messages but please note that promotional content is not allowed after 24 hours of a subscriber sending your Facebook page a message. 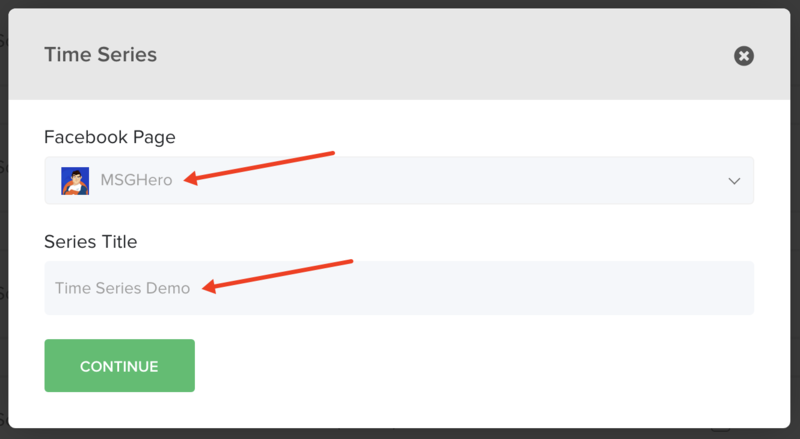 In order to create a time series, click on "Engage" in the top navigation menu and select "Time Series". Click "+ Add New Time Series" (orange button in the top right corner). You'll be prompted to select a Facebook to create the time series on, as well as to insert a name for your time series (for personal reference). Click on "Add Message" (as shown in the screenshot below). As you'll see, you're able to trigger messenger leads directly into your time series after they subscribe (as soon as they become a messenger lead of your selected Facebook page). How to edit a time series message? Click on edit icon on the right side as shown in the screenshot above. Once you click edit icon, the message customization is exactly the same as in the rest of the MSGHero software. How to edit the time delay between each message? In order to edit the time delay between each message, you click the "Edit Trigger" orange link on top of the respective message. This will allow you to edit the time between the user subscribing to be your Facebook page messenger lead and them being sent the respective message. As you can see in the screenshot above, I made it so that a user receives the first message in my time series 1 day after subscribing, and the second message 2 days after subscribing. Of course, you're not just limited to "Days" as a time delay with MSGHero. You can delay it down to minutes and seconds, too! How to add new messages to the existing time series? 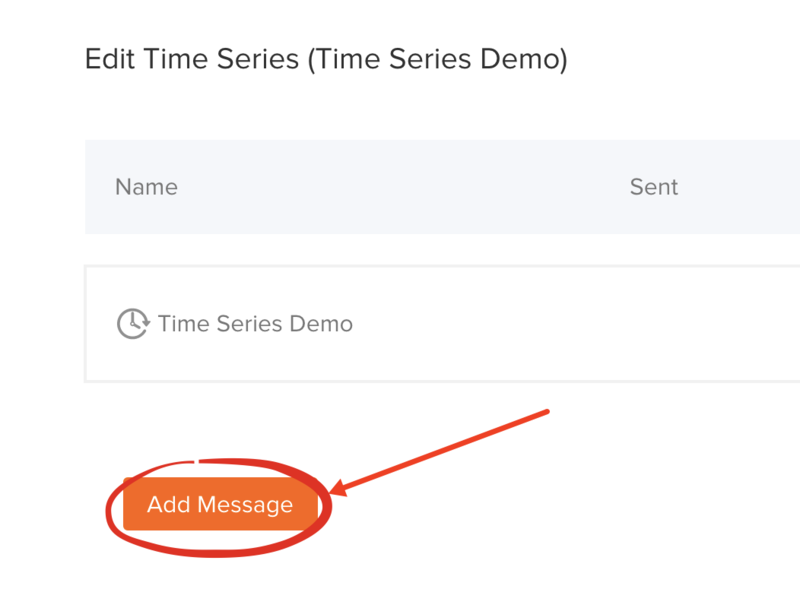 If you'd like to add a new message to your existing time series, for example a third message in my screenshot above, you'd need to click the "Add Message" orange button in the bottom left corner of the time series. How to pause/delete a time series for a selected Facebook page? If you'd like to pause or delete a time series for a specific Facebook page, you can do so by clicking the "On/Off" switch under "Status" on the Time Series dashboard. There are four different ways to trigger a prospect into a time series. A user becomes a messenger lead/subscriber of your selected Facebook page. Clicking a button created under our "Button Widget" module under "Grow" in the main menu. Clicking a button inside one of your messages you have created. Manually tagging a messenger subscriber or multiple messenger subscribers (in bulk) into the time series. The first is quite self-explanatory. If this is the case, the messenger lead will be triggered into your time series as soon as they become a messenger lead (after they subscribe). In order to set a time series to this setting (important note is that you can only set ONE time series to be the 'default'. This means all messenger subscribers that are generated will be sent through this specific time series), you'll need to click the "Default Series" checkbox next to the time series as shown below. When you're setting up your button, there is an option to select a time series. If you select a time series when setting up one of your buttons, any messenger subscribers generated through that button will automatically be triggered into the selected time series. 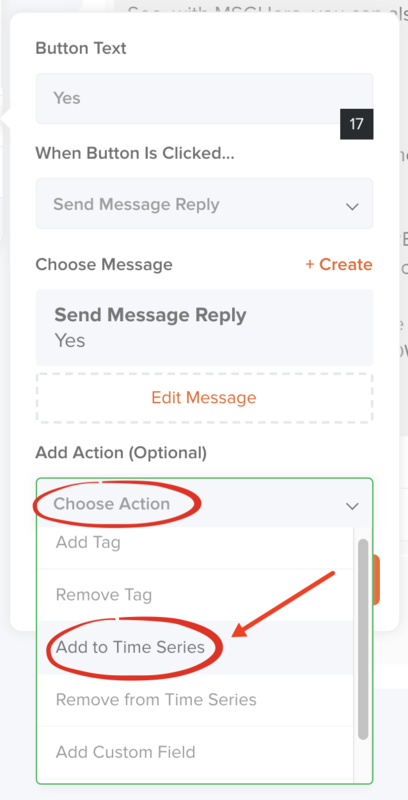 When setting up a button inside of one of your messages, if you select "Send Message Reply" under "When Button is Clicked...", you'll notice an "Add Action" drop-down appear below (as shown in the screenshot below). Here, you can select a time series. Anyone who clicks that button will automatically be triggered into the selected time series. The fourth option can be found under "Analytics" in the top navigation menu. Once you've clicked that, select the same Facebook page that you have set your time series up on. We do cover analytics in a separate article but for the purpose of this example, we'll just be covering how to tag messenger leads into a time series. Scroll down to the "Subscriptions" table. Click the "View Details" icon on the right side of the subscriber row as shown in the screenshot below. A pop-up will appear with all the subscriber's details. Click the "Add Time Series" button and below that select the time series you'd like to tag them into (as shown in the screenshot below). This messenger lead (subscriber) will now be tagged into the time series I just created! 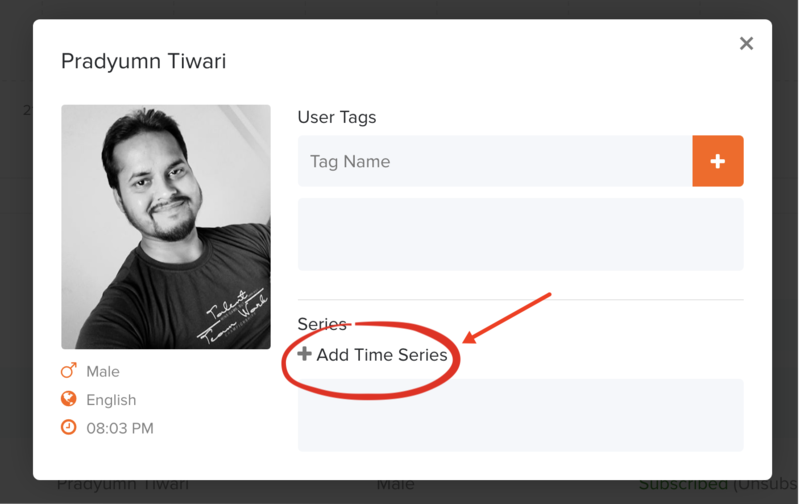 In order to tag multiple messenger leads into your time series, we again scroll down to the "Subscribers" table but instead of clicking on one specific subscriber, we select the ones we want to add to the time series by checking the checkbox next to their names on the left hand side. 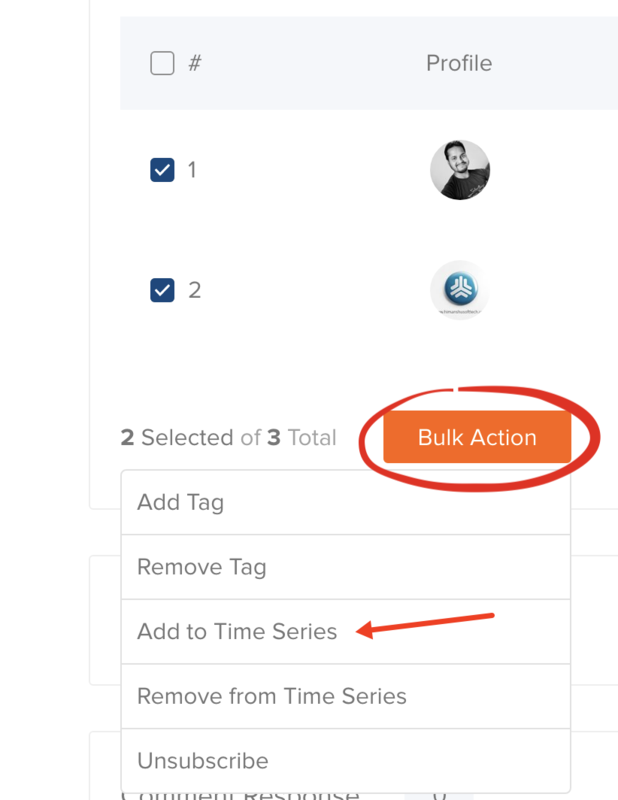 Once you have selected the subscribers you'd like to tag into your time series, look at the bottom of the same "Subscriptions" table for the orange "Bulk Action" button. Click "Add to Time Series" from the drop-down menu. Select your time series from the drop-down menu and click on the "Add" button.